Being an adult is hard. You have to commit yourself to a job to make money to pay for food, gas, rent, a mortgage, college tuition, and a myriad of other little things that all add up. Most of our time is dedicated to working, and it’s hard to find time for leisure activities. Regardless of where you work, you need to take breaks now and again. It’s always a good idea to do something that takes your mind completely off of the task at hand, and while video games and movies are fun to take in, you probably shouldn’t have them at work. Something that might be a more acceptable method of play in the office is something that will still engage your brain, be fun, and mindless. We used to play with a myriad of exactly this kind of toy when we were little, but now that we’re adults, no one wants to be seen with them. That’s why Hero Design created the Everbright. This is essentially a modern Lite-Brite that is big enough for up to 5 full-grown humans to play with. 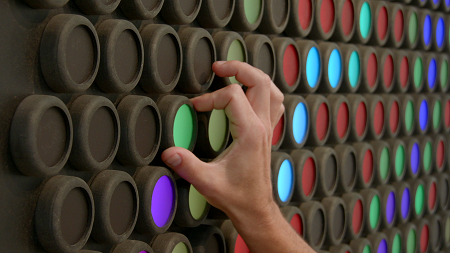 This is a great way to refresh your brain, as all you need to do is turn the dials and pick which color you’d like. You can create patterns, pictures, or just have a solid sheet of your favorite hue on the wall. This is a great way to work, play, and also meet your coworkers, as it’s pretty hard to resist playing with a giant toy like this. This massive wall has either 232 or 464 dials that are all on a board that is 46×93”. It’ll cost you anywhere from $14,000 to 25,000 depending on how many dials you want, and comes with three preset animations.